Aras Innovator® is a single integrated solution for PLM, PDM, and custom applications. 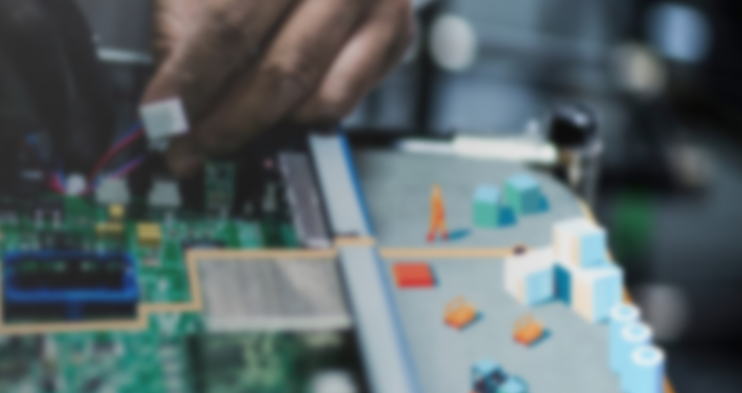 The model-based technology coupled with Aras’ open-source philosophy has completely changed the old paradigm of PLM and provides a solution that just works. Today, Aras is the fastest growing PLM solution. Aras’ hybrid open source model supports a fast-growing user community that helps the Platform facilitate business value and continual improvement. Anyone can start using Aras Innovator. Select capabilities are enabled for paid subscribers. Aras offers over 35 ready-to-use solutions to help manage everything from BOMs and engineering change to projects and requirements. Explore the full list of capabilities. Finally, a PLM platform that encourages customization and tailored configurations. Aras enables you to do business your way – not the other way around. No subscriber is left behind. Regardless of the customizations you’ve made, Aras Innovator is up-to-date with the latest version. Aras seamlessly connects to your organization’s critical applications ranging from CAD tools and Vaults to ERP applications and CRM tools. Aras Innovator can be set up and hosted anyway you like. With close partnerships with Microsoft’s Azure and AWS, the cloud options are secure and proven. What do analysts think and how does Aras stack up to the competition? Register for one of our bi-monthly webinars focused on highlighting new Innovator features and solutions. The Digital Thread makes connections to critical information, allowing you to track a product and its digital assets from concept, through design, manufacturing, quality, and field maintenance. Get the Overview eBook to learn more. Aras Innovator has been built from the ground up to help organizations master the Business of Engineering as product complexity and market competitiveness continues to increase. Learn more about the Business of Engineering. Open Software - To customize or extend traditional PLM applications you must use the vendor’s published API. But without detailed knowledge of the internal workings of the application, you are working blind. Aras takes a different approach – we make the source available to you so you can modify it directly with the control and flexibility that your business needs. Learn more about Aras' approach to open software. Model-Based SOA - Aras is designed to fit your business needs, rather than the business processes needing to compromise to fit the software. At a technical level, this is achieved by not hard-coding the object model definition and rather separating the two. The result is a web application framework consisting of web services optimized for performance and scalability, which form a service-oriented architecture (SOA). Learn more about the SOA Platform. 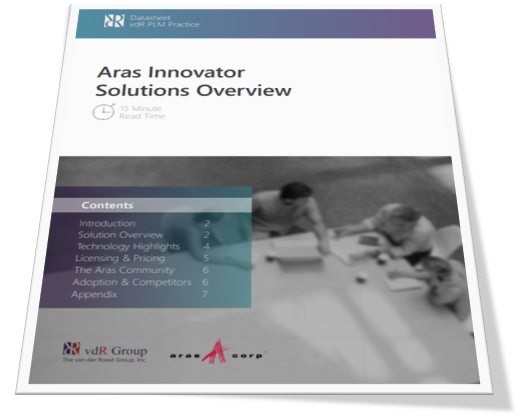 This Solutions Overview PDF provides an introduction into Aras Innovator, the solution’s various capabilities, technology, licensing & pricing, and the user community ecosystem. The PDF takes about 10 to 15 minutes to review. There are two options: Subscription and OPEN. OPEN is free and provides access to many core capabilities. Subscription is paid and provides access to all capabilities except some CAD connectors. Subscriptions start at a monthly rate of around $75 per user and goes down depending on rising user count. Large and small companies alike can have Aras deployed in days or weeks - not months or years. Aras’ ease of setup and extensive training resources coupled with vdR’s expertise can dramatically accelerate time-to-value. As an Aras Gold Partner, vdR has a proven record of on-time deployments and resilient solution architecture. Aras provides in-depth training courses in Asia, North America, and Europe and hosts online forums and community sites. These courses are made available to Subscribers at no cost. Moreover, Aras has a highly-engaged and fast-growing user community supported by globally held user events such as the Aras Community Events. The vdR Group (vdR) is a full-service Aras Gold Partner focused on solutions and services for build-to-order and engineer-to-order manufacturers as well as automotive suppliers. We offer a unique combination of decades of industry expertise, technical know-how, and a team that recognizes the importance of innovative contributions, high-quality work, and on-time deliveries. Our solution-oriented approach includes consulting, solution architecture, end-to-end implementations, integrations, and ongoing support. Over the last three decades, vdR has helped drive digital transformation at 100s of companies, ranging from Global Fortune 500 manufactures to cutting-edge start-ups. Today, 220,000 users leverage vdR’s engineering and manufacturing solutions. vdR is proud to be a Gold Certified Aras Partner providing end-to-end services and solutions. The vdR Group and Aras provide pre-configured Innovator solution modules that target specific disciplines within PLM, PDM and Platforms. 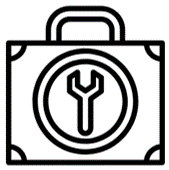 Many of the solution modules are available out-of-the-box (OOTB) with the free download. These free OOTB modules are designated below as "OPEN." Companies that subscribe to Aras Innovator also have access to the "OPEN" modules but also a number of other modules. Explore the different pre-configured solutions below. You can also explore these by industry. Traditionally companies face high initial costs to acquire a PLM or PDM solution, followed by unpredictable on-going costs for support, maintenance, and upgrades. This situation places a huge burden of risk on these companies, requiring them to commit significant expenses and resources long before the success of the system can be realized. At vdR we believe that you shouldn’t have to carry this risk. That's why, uniquely, we provide complete flexibility in how you access Aras Innovator and the services. In business, results determine success; your PLM solution must be implemented quickly and seamlessly and adopted effortlessly over a wide range of disciplines. The vdR Group's Aras Consulting Services are designed to do exactly that. Our consultants understand the business challenges you face. They have deep and broad experience in the PLM industry, implementing PLM solutions in engineering and manufacturing environments around the world. To ensure the success of your Aras Innovator implementation, we offer a range of training and educational options for individuals and organizations. Whether you're just starting or ready to take it to the next level, we have a program that can help you improve productivity, enhance skills, and drive business optimization.